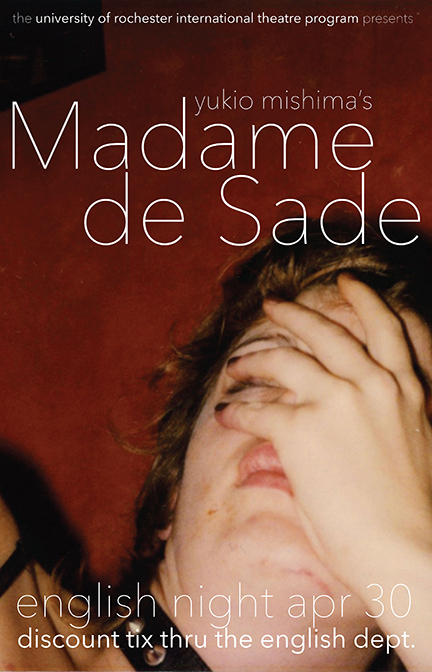 English Night at Todd Theatre: Madame de Sade will take place on Wednesday, April 30. Theatregoers may book discount tickets for English Night by calling the English Department at 275-4092, or by mentioning UEC at the box office. English Night is sponsored by the Undergraduate English Council and the Department of English. After the show, there will be an opportunity to meet the cast over refreshments in Todd Lobby. The International Theatre Program’s production of Madame de Sade will run through May 3rd. Yukio Mishima—celebrated & controversial; a poet, novelist, film director, and right-wing nationalist who committed ritual suicide after a failed coup attempt—was one of Japan’s most important post-war artists (and thrice nominated for a Nobel Prize). His play, Madame de Sade, examines the Marquis de Sade—the man, his proclivities, and the myth he became, through the eyes of his wife, her family, and her society. The play’s examination of the sacred and the profane, the illicit and the legal, the sinful and the debauched, emerges from the single question: why did de Sade’s wife stick by him through imprisonment and controversy, and only abandon him at the moment when he finally regained his freedom?